Howdy bibliophiles, my work on Kip the Quick is rounding the bend and I have something exciting to share. I've heard an incessant blathering on, and on, and on about 99Designs. I thought I'd finally check them out, and wow! Not to say that I will never seek a book cover artist to work with direct, but with limited time to choose, there was great appeal to plunking down my design brief and asking for submissions. And let me tell you (if by chance you are blind and can't see the above pics), there were some phenomenal results. I've already selected a winner, but take the poll, and tell me what you think of the 3 finalist designs that I wrangled my brain over. Curious? Want to try it yourself? I heard about it first on the Rocking Self Publishing podcast (great business/marketing listen for any of you indie writers out there), and I'll point out there is a power-pack upgrade you can get via this link (and support Simon's awesome endeavors on RSP) http://www.99designs.com/rsp. Worked for me -- and will give your contest extra attention. And very importantly, a BIG THANKS to the wonderful artist contributions; and all their time and passion. Running the design contest was fantastic. Time permitting, I'm hoping I can snag them into giving some work-in-progress breakdowns that I can share. It was also a lot of work. I'll give a piece of advice, since I almost never do that... If this sounds like something you want to pursue, be aware that you will still need to dedicate Time for good results. Focus up front on providing a detailed design brief for the artists, including pictures of what you want and descriptions of the concept, the story, the scene, the character(s). But be open to what they provide. Give detailed Feedback. I was surprised multiple times as the front-runner changed position between 3 different artists. I don't think this would have happened if I hadn't kept up with each iteration, giving my critique and clarifying on what I wanted. The end results is every bit as awesome as I had hoped for, but still different from my initial concept. What is Kip the Quick, you ask? A Heist Like no other; a Payday to match. If Kip can only Survive. The novel will be done in the next couple months, and under 200 pages. Sign up for the newsletter to hear about pre-orders, the release and any specials I plan to run. And get free stories! Do you like to leave book reviews? I need your help! E-mail me, or comment below. 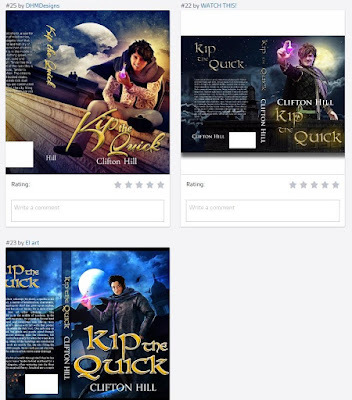 For a limited time I'll be willing to part with free ebook copies of Kip the Quick for a potential review. No strings attached, and no hard feelings. I strolled down the thoroughfare, nodding at a merchant as I tilted my hat, a bright pink feather bobbing at its top, even as I snatched a fresh roll, still steaming; slipping it into a low pocket. Misdirection, grab the eye, make them see what you want them to. “A splendid day, miss,” I bowed to a fine lady on the right, my very most sophisticated. She turned and touched her veiled cheek. “Charmed, I’m sure.” She fluttered eyelashes painted a vibrant blue, the smile as perfectly manicured as she. And false. But so was I. Kip the Quick. Strutting like a spoiled brijold of this piss-poor town. But one had to fit in. And on the Ave of Lords, where jewels were sold, fortunes made and lost: no one watched the food. My stomach trembled. “Shh, in a moment.” The smell of meat pies and custard delicacies served in real glass bowls was almost enough to make me stagger. The smile rolled off my face as I adjusted the scarf, the fabric not as fine as it looked, when I locked eyes with one of the ashen brijold. The man had all the jerky motions of one so wasted on colaine, his skin was an obvious gray beneath the rich clothing; then there were the dead eyes, and a slack jaw that seemed to clench, to create some sort of masquerade of strength and sternness, that he had probably lost long ago. The man dismissed me without a flicker of emotion, set down his teacup, the server giving him some lost platitudes as he tilted his hat to the lady entering with all the warmth of a clock striking five. The brijold lifted his vibrant blue scarf off his shoulder and with a stiff swing — as if striking a child — swung it across his face and tied it quick. I turned to admire a porcelain vase with swirls of ochre and obsidian that would cost enough to toss me into the Peacekeepers’ pits until my teeth fell out. I tried not to stare at the ashen’s half finished biscuit, dripping with apple jam that the server moved to sweep up as if it were nothing better than a fruit rind picked clean. My hands hovered near the vase. It would make a loud noise, draw attention, enough for me to save the succulent morsel. But the moment passed and the wasteful fool went strutting from the building, his polished boots ringing against cobbles that seemed to have never suffered the deluge of a summer dust storm, and the server picked the offending delicacy up, and into the wooden tub it went. My eyes lingered as she set it on a side counter at the rear, sweeping back by the polished tables, her skirt swishing behind. It was an awfully clean-looking waste bin. Maybe I could wait for it out back later. But I sighed instead. And now — because I had lingered too long otherwise — I turned to the vase merchant, exclaiming profusely at how lovely the vase was; drawing his attention, his eyes practically sparkling with the certainty of a full price sale. Curse my wanton belly, but now it was time to make a show. Except for the stealing part. She would never have condoned that. Into the lumpy satchel went a pair of polished shoes and the starchy pants of which I owned entirely one pair. One pair that was starting to smell of rancid butter. But that could be rectified. The prize of the day was a smattering of pastries, two apples, something else I could not name and the smell was nearly reward enough. But now I couldn’t return to the Ave for another week or more. Melting into the shadows, I sprinted away, satchel on my shoulder, bare feet barely brushing the cobbles. Two turns and I climbed a rough stone wall, leapt onto the roof and three roofs later was sitting in the shadow of a little used lane, munching happily on my find.